Giorgio Morandi is Italy's most famous 20th century still life painter. He lived from 1890 - 1964 and is most remembered and renowned for his extensive body of still life paintings (called natura morta in Italian). Giorgio Morandi's still life paintings are instantly recognizable for their muted color palette, subdued and unsophisticated subject matter, and quiet simplicity. What makes his still life paintings so remarkable? Let's find out! This page provides an overview and analysis of the main features and characteristics of Giorgio Morandi's still life paintings. We'll take a look at the objects in his paintings, his use of color and tone, his sense of composition and perspective, and how he handled the paint. We'll examine how all of these stylistic factors come together to create paintings that emanate a timeless sense of hushed contemplation. Morandi's subject matter gravitated towards everyday objects that could be found in any kitchen - such as jars, ceramic bowls and vases, bottles, pitchers, jugs and boxes. These objects are familiar, yet they are purposely stripped of any identifying marks such as labels. This lends the objects a sense of anonymity and universality - these objects could easily come from anyone's kitchen. They could even be found on the shelves of your own cupboard. The objects are placed on a nondescript tabletop, grouped together in various arrangements. The key factor is that these domestic objects are utterly unremarkable. They are not loud and ostentious. They do not demand our attention. These are not the objects of the rich and famous. Instead, they are silently humble. They represent a reality that is not dressed to impress. By focusing on objects that are commonplace, he shines a light on the functional objects we use everyday that are often overlooked and taken for granted. Morandi paints his still life objects to have a weighty, chunky appearance. They seem solid and sturdy - at times appearing almost architectural in form. This style resonates with the functionality of these objects - these objects were designed to be used often, rather than admired. The objects have a matte (almost dull) surface appearance, lacking reflections or any other shine. Many of them are painted with the absolute minimal amount of shading and highlights. Morandi takes subtle gradations of greys to new levels, at times only hinting of 3-dimensionality while still retaining a monumental presence. Take a look at the painting on the right to see what I mean! 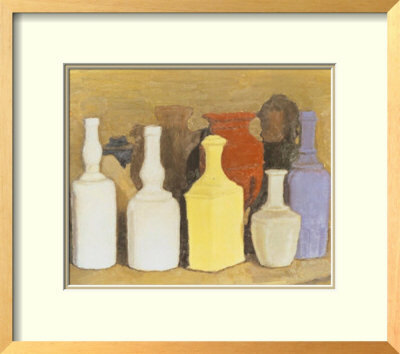 Morandi uses a muted color palette for his still life paintings, often working in a range of whites and greys, occasionally foraying into other equally somber colors. His deliberate use of pale color creates inward-looking paintings that are sensitive to the objects portrayed. Giorgio Morandi's still life paintings employ a careful balance of subdued colors and subtle tones. As mentioned earlier in reference to how he builds (or rather, hints) at form, he stylistically works in a limited tonal range. Tone refers to how light or dark a color is. Therefore, a light tone can be used to indicate a highlight, and a dark tone can indicate a shadow. In the above painting, notice how the objects almost appear flat, because of their lack of a wide tonal range. The white vases only carry a slight hint of grey at the sides, demarking 3-dimensionality. Although he is largely known for these stylistic qualities, not all of his paintings are this subtle. His painting on the left has a clear light source, resulting in heavy shadows on the right. The perceived solidity of these objects is undeniable. Although the composition of Giorgio Morandi's still life paintings look deceptively simple, he would spend weeks obsessively shuffling the objects around to get just the right placement. He would experiment with different combinations of objects overlapping and placed next to each other in a variety of ways, looking for the right medley of forms. The perspective of his still life paintings is always looking straight on at them, or looking down at them. There is a certain mysterious ambiguity to the location of Morandi's still life set-ups. Because it's impossible to pinpoint a specific location or identify the owners of the objects, the paintings enjoy an anonymous, silent quality. Morandi works in a painterly style, in which the brushstrokes are visible and thus become an important part of the composition. He is not concerned with hiding the brushstrokes to create a smooth surface appearance. Instead, he paints in such a way that the quality and handling of the paint have as much contemplative importance as the objects he is painting. Giorgio Morandi's still life paintings are the work of a thoughtful, dedicated soul who stretched his own canvas and ground his own pigments. He was a reclusive figure who was obsessively devoted to his painting. From his early influences of Cubism and Futurism, Morandi adapted his own recognizable painting style. He produced a plethora of still life paintings that carry an ageless quality, superceding time and place. Giorgio Morandi's work was well-received during his lifetime - winning first prize at the 1948 Venice Biennale and in the 1957 São Paulo Biennale. As a further honor, the renowned Italian filmmaker Federico Fellini exalted Morandi's work in his film, La Dolce Vita. 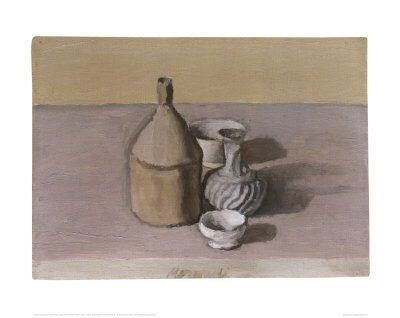 Amongst Italy's already impressive list of master artists, Morandi is considered a modern master. His paintings are deceptively simple and discreet, requiring an openness and sensitivity to properly absorb, understand and appreciate.